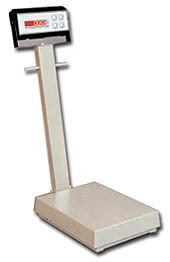 A perfect replacement for outdated mechanical portable beam scales. Durable, heavy construction, priced affordably, it is quick and easy to use. Less maintenance means longer life. Dual inboard wheels allows for effortless portability, secure loading condition in weigh mode. Capacities 300 lb., 600 lb., 1,000 lb.